LaundryMonster no longer rules our roost, alhamdulillah! My stress levels have dropped since. I can actually sit down and work every evening for productive 20 minutes or so and still have time to read to the kids if they decide to stay up late on Friday and Saturday nights. Without me losing my mind. I am not sure if I did share openly about my low period? I was liking The Other Half less because he too, was not coping with the ironing. When I had to put in extra 4 hours a week to just cover for him, I started feeling resentful and bitter. Actually, exhaustion and feeling depleted can be very damaging. We had a heart-to-heart talk and agreed to budget for a part-time, live-out helper. 2. I feel less resentment and can actually watch a DVD at night at home once a month with The Other Half without guilt (or running short of things to wear that actually matches). 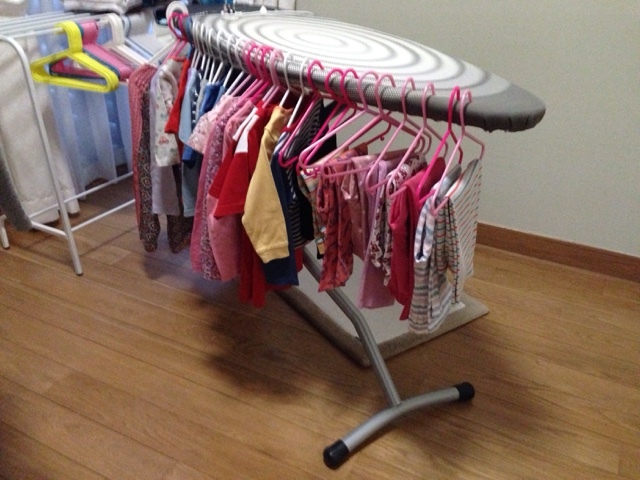 I used to feel like a useless mum not in control of my home and chores because of LaundryMonster. Shopping for clothes is more liberating now because I do not focus on how long it would take to iron anymore and choose base on what looks good on me. 3. Girl has her clothes all sorted out now. I just focus on her Taekwando uniform and swim bags. Those frills and bows, sashes and pleats? Miss M does not mind them one bit. Yay!! 4. Bean has a good choice of shark, cars and trucks tees and pajamas with their matching shorts/pants. Bean's tantrum from not getting what he wants to wear when he wants "it" has reduced significantly. Even when a favourite item is still in the wash, I can just reason with him, "Aunty M will iron it for you after it is washed. She will be here tomorrow." Magic. 5. Miss M is happy with the extra income and since she considers our laundry bulk small for a family of four, we are an easy family to work with. We count of blessings for having Miss M. To think that we had her phone number all these while but not trying out her services until The Other Half and I were recovering from our respective surgery. We had been silly, haven't we?